At DoneDeal we take our users' privacy and safety very seriously. 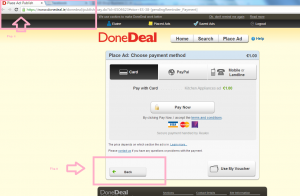 Remember you can help keep DoneDeal safe by contacting us about anything you feel is suspicious. We have taken the following anti-phishing measures. We do not request your bank account or debit or credit card details in a phone call, text message, email or email newsletter/ezine/promotional email. We may direct you back to the Place an ad section. This is what a legitimate page looks like. Fig 2. You can press the Back button to go back into your account. When you place an ad and want people to contact you by email, you leave the tick box beside “No email responses for this ad” blank. This means anybody who contacts you through the DoneDeal website and any replies you send are within our safemail system which has been designed to keep DoneDealers safe. We advise that you do not give out your email address at any stage e.g. via text message, phone or from within the DoneDeal safemail system. Some phishing scams start with a text messages asking you to email a person. If you have a smart phone, once you click the email address your email account opens and without realising it you end up emailing the person and are outside the safemail system. We have made it more difficult for scammers to access phone numbers by making sure visitors to an ad on the website must click to view the number . Viewers of adds on an app click to call the number. We regularly update our help section and also our blog with advice on safety and security. Phishing is so sophisticated, it is constantly changing. No organisation in the world knows about a phishing attempt until its customers report getting a suspicious email/SMS/phone call. That’s why we need you to keep up to date and let us know when you receive some suspicious communication. It’s better to be safe than sorry!